Scott Berry with his CAD components. In today’s digital world of 5.6 or 11.2 DSD and PCM up to 768Khz sampling rate, anyone who does not conform to the changing standards and advancing frontiers would be swept out to oblivion. Not Mr Scott Berry, an American/German engineer who founded Computer Audio Design (CAD) based in the United Kingdom and is fondly known as ‘Mr 1543’ in the DAC designing business. This is simply because he is oblivious to the newfangled digital-to-analogue chips with uber impressive figures and is sticking to using obsolete Philips TDA 1543 DAC from 1991 in his CAD DAC. 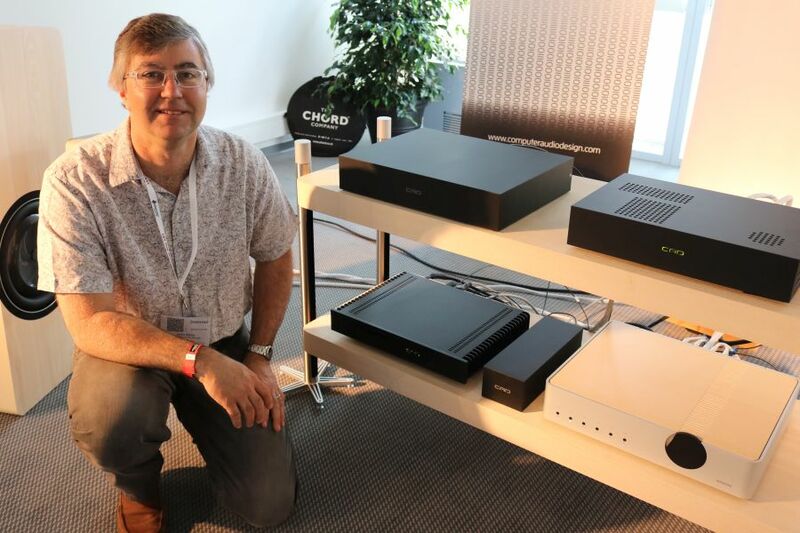 I had posted about his CAD 1543 DAC when it was launched (see …) and Scott had e-mailed to thank me for the article. There were a few e-mail exchanges since then and during the recent Munich High End show, I walked into his room, identified him from his name tag and introduced myself. He remembered my posting of his DAC and we started chatting. “Because it sounds better,” was his obvious answer. Having said that, Scott opined that the chip contributes maybe 35 percent to the sound quality. Just as important are the power supply and output stage. His output stage is passive and uses Duelund Audio capacitors made to his specifications and ETi tellurium copper RCAs. In his CAD 1543 DAC are 16 Philips Resistor/Ladder type TDA 1543/N2 chips to achieve what he calls “effortlessly natural sound”. The DAC has no oversampling, no output filters and async USB input with full galvanic isolation. It accepts PCM files up to 24/192. He said the TDA 1543 chips can decode PCM up to 192kHz but the 24-bit data is reduced to 16 bit. Scott has been busy since he launched the DAC. He now has a CAD Audio Transport (CAT) which is a ripper, streamer and player with internal solid-state memory. It is made to order to suit your system be it a two-channel rig or a home network. It can be controlled remotely by any tablet or smartphone with Apple or Android OS. The CAT itself is Windows based which enables it to be adapted to new software and technologies. Scott has also designed a USB cable with separate power conductor (it can be ordered without the power cable) and grounding devices. Scott told me he is scouting around for a distributor for the Malaysian and Singapore markets.